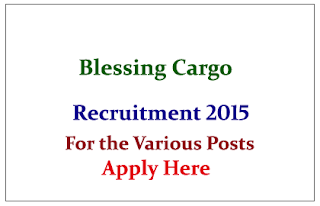 Blessing Cargo is recruiting for the post of “G” Card Holders, “H” Card Holders 2015. Interested and Eligible candidate can apply here. A leading CHA & Freight Forwarding Company requires the following personnel for their Chennai Office. Minimum 5 Years Experience With Thorough Knowledge In Sea Import Clearance, Documentation & Operation. Minimum 2 Years Experience With Knowledge In Visual ImpeSx Software In Import Documentation & Online Filing. Minimum 3 Years Experience With Knowledge In Air (Or) Sea Import Clearance Process. Minimum 2 Years Experience In Sea Do. Must Have Two Wheeler License.